Gardening is not an inexpensive activity or hobby. Getting into that activity entails a lot of expenses involved. In order to grow healthier and more beautiful plants, one must be willing to invest and not cut hold back on the things that the plants will need. Fertilizers are very essential to plants because it supplements the soil and give more nutrients that the plants need. However, spending on fertilizers is not a one time expense. It happens several times during the plant’s cycle in a season. Making your own compost is a very good alternative to buying fertilizers. Composting is like recycling all your biodegradable wastes and have them decomposed by worms. Whatever is left of it is called the compost and adding it to the soil is a very cost-effective way of giving nutrients to your plants. 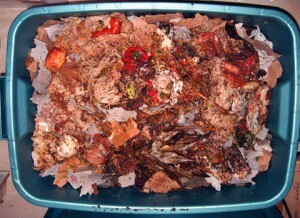 There are several ways you can do composting. The more common methods of composting are usually done outdoors and the whole thing can get pretty messy. You also have the burden of keeping stray animals from digging through your compost and you have to trek outside everyday to add more waste to your compost. However, by making a plastic worm compost bin, you save yourself form all that unnecessary burdens. The principle in making compost through a plastic worm compost bin is similar to all composting methods that utilize worms through the process called vermicompost. The only difference here is the compost bin used. From the name itself, you can already tell that this method uses plastic bins instead of wood or wire mesh. The use of plastic bins provide for a more tidy method of composting such that you can do the task of composting indoors instead of doing it out side. Creating a plastic worm compost bin is very easy and it is relatively cheap too. For the compst bin all that you are ever going to need are plastic bins. Two of the same size that can be stacked on top of the other should be enough. You will need to drill holes in the bottom and the sides of the bin to provide for ventilation and drainage as well. The holes at the bottom of top bin will allow entry of worms as they move from the bottom bin which they have finished decomposing to the bin on top which contains another set of biodegradable wastes to be made into compost. The following should be placed inside the compost bin. Make a bedding at the bottom using shredded newspaper that is moist and fluff it out hen add some leaves and food scraps and soil. Also, you have to add the worms into the mix since it is unlikely that they will come crawling indoors in search for whatever your compost bin has to offer. Cover it with a most cardboard. For some reason, worms just love eating away cardboard. Do not use the lid of the bottom bin to cover it, instead stack over it the second bin. Like the one at the bottom, it has the same contents and worms will just crawl up inside it once they are done with everything in the bottom bin. Drainage will be expected. Do not throw it out. Use the cover of the bottom bin and use it to catch the drainage as this contains a lot of nutrients that is very good for plants. Plastic worm composting is very easy to do. Since it is cheap you actually save up on the cost of maintaining your garden.